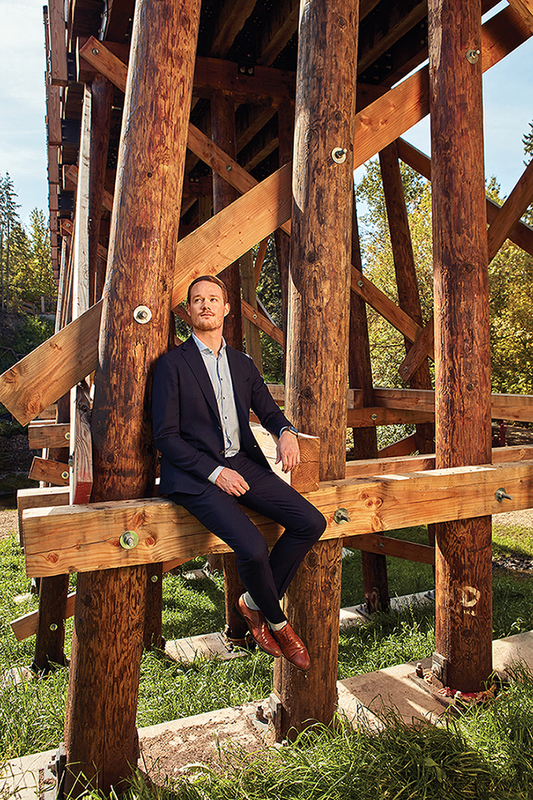 Why He’s Top 40: His business instinct and understanding of technology are helping him transform the forestry industry. Ask any bright-eyed, ambitious, second-year university student about entrepreneurial opportunities in his or her field of study, and you’ll likely get a range of responses. Less likely, though, is finding those willing to take the leap and make those ideas a reality. For Chris Kallal, the leap was easy. During his second year in the Bachelor of Science in Forestry program at the University of Alberta, Kallal and classmate Tyler Niles identified an untapped opportunity in the planning, proper development and reclamation of Alberta’s natural habitats after oil and gas developments. So the pair jumped in and founded NiKal Environmental Solutions, now known as Wild + Pine, in 2011. Since opening, the company has expanded from its roots as a two-person operation to a larger team, operating out of an office in the Edmonton International Airport’s Alberta Aerospace and Technology Centre. Wild + Pine worked with energy industry giants like Shell Canada and ConocoPhilips and pioneered the commercial use of drones in forestry in Alberta.